Golden Retriever Dog Breed Information : Dogs are known to be man’s best of friends in every given aspect. They are a good playmate, a good stress-buster, a loyal friend and a trustworthy companion. They can be compared to one’s own children since they are cute and friendly, and will have your back at all times. Once such dog is the Golden Retriever. This species is probably the most popular and the most sought-after of all dog-species. In the paragraphs below is everything you need to know about the Golden Retriever, and much more. 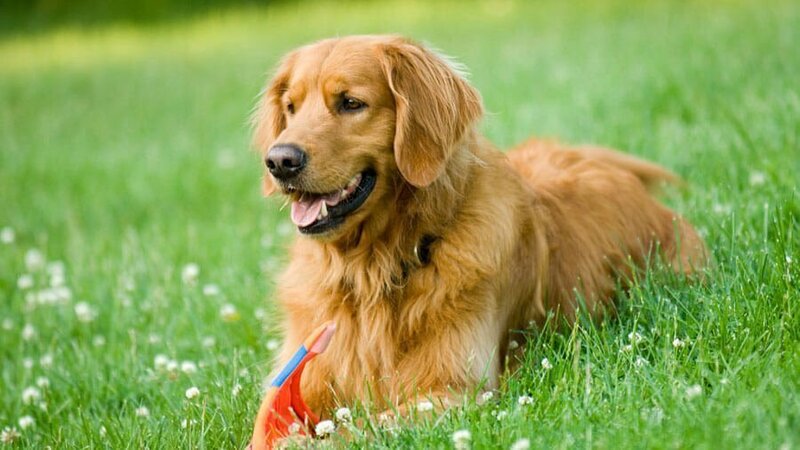 In this article you will get complete Golden Retriever Information that you will educate and enlighten the dog-lover inside you.. But before we begin I would like to mention that most of the information will be similar to the that of English Cream Golden Retriever Information. 4 Golden Retriever Information on What Special Care needs to be taken? Here are some interesting facts, Although the Golden Retriever first appeared as a working dog is the fields in the early 20th century, it wasn’t until a long while later that it was recognized as a separate species. Due to their intelligent and smart nature, they were previously preferred as working dogs. Then they were chosen to perform at the circus. Today, they are one of the most popular dog breeds in the U.S. Also, they are quite adaptable, which makes them even better for the role. But as time passed, it became more and more apparent that Golden Retrievers work best not just as work dogs or at the circus, but also at home as playmates and therapy dogs. This is when they started getting adopted as pets. A shiny glossy coat which is usually golden or cream in color is where they get their name from. They are fine runners with amazing and agile body movements. They are swift and extremely active. For your information, Males Golden Retrievers usually weigh about 29 – 34 kg, and females, 25 – 29 kg. Speaking of their physical growth, males can grow up to a height of 56 – 61 cm, whereas it is 51 – 56 cm for females. Their bodies are just the right size and beautifully structured and protonate in every possible way. It is not just for no reason that they are the most popular dog breeds in the U.S. They are also quite calm and composed which gives their overall appearance a classy and elegant vibe, perfect for a Golden Retriever. Golden Retrievers must only be given food that is meant for them, specially. The organic foods work best for them. However, make sure you consult with their vet first before putting them onto any kind of diet, this is because some individuals may be allergic to certain ingredients in certain dog foods. Make sure you don’t switch brands too often, which may lead to unwanted issues with your dog’s health. Feed them as per their age and their daily activity dose. Remember to improve and increase their diet as and when they grow up. Include supplements if needed, but only after consulting their vet. Read More – How to Improve Your Dogs Diet ? Not surprisingly, Golden Retrievers are one of the most intelligent species of dogs out there. They are passionate and considerate, which is associated with them being intelligent too. Their sense of smell is highly developed. Which is why they are trained to be leash dogs to follow or track down someone. Many a times, they are also used by blind people as pets to lead them to their destination. They are extremely emotional and sensitive too. Hence, harsh training methods like beating will not work on them. They can only be trained with patience and time. This breed is also known to take part in activities like working test, obedience, filed trials and breed shows. They even excel at these. Not only that, they are put to test for their agility and intelligence, and they prove themselves reliable even then. Want to know the best part? They can follow simple instructions and can be relied on to assist when called upon. The above points prove that Golden Retrievers make the best of pets and companions and also trained dogs for various purposes. Read More – How to Train Your Golden Retriever Dog? Golden Retriever Information on What Special Care needs to be taken? The underlying fact is that pups need to be de-wormed regularly, every 6-12 months precisely. There needs to be special routine to have them cleansed every day, and also to look after their personal hygiene. Also, make sure to pay frequent visits to the vet to keep you Golden Retriever’s health in proper shape. Golden Retrievers are known to suffer from separation anxiety. That is, they need to be physically attended to at all times, without which they turn sad and depressed. So, consider adopting one only of you have at least one family member staying home at all times. These dogs are better able to adapt themselves in houses with a lawn and a backyard as opposed to cramped up apartments. In order words, they prefer spacious surroundings to live in comfortably for obvious reasons. They are not usual ‘barkers’ but are known to turn into one if left alone for long periods of time. If you are looking for a watchdog, then Golden Retriever is not the one. They are calm and collected by nature, which is why they won’t turn aggressive even when the situation calls for it. However, they do warn you of a stranger-danger lurking nearby. Due to their less-aggressive nature, their prey-drive is minimum. They will immediately befriend any other animal in their vicinity instead of chasing it away. They are good not only around children but also around other pets that you may have like cats, rabbits and birds. They’re playful and smart. Given their intelligent nature, they are quickly able to learn new things and games and actively participate in them too. The bottom line is this, If you have never owned a dog before, there can be no better choice than a Golden Retriever for you to make a start. Dust mites and pollen may trigger an allergic reaction in Golden Retrievers. Try and keep them away from it as much as possible. Certain seasonal allergies of various grasses, mold and pollen may prove to be fatal to some individuals of this species. Avoid it completely. Various components of commercially produced food products may not be received well by Golden Retrievers. Consult its vet before zeroing down on any food product. Ticks and flea bites are not uncommon, but are also not acceptable when it happens to a Golden Retriever. Take care to keep them at arm’s length or get them a collar which keeps fleas and ticks away. Some home-cleaning products may also sport an allergic reaction on your Golden Retriever. Keep them away when you are cleaning your home with such commercially produced cleaning solutions. Sometimes, it can only be the environment you live in which may not be suitable for your Golden Retriever, like too much noise or too much air pollution. Keep an eye out for anything that seems to be disturbing them. Once your Golden Retriever has attained its full maximum physical capacity, it will, as all living beings, start to age. Slowly but steadily you will start noticing subtle signs that will point out that your dog is no longer the fit and bouncy thing you once had as a playmate. Your Golden Retriever will start preferring to remain within the house instead of going out on walks. They will need to see the vet more frequently than younger dogs since now their immunity will start declining considerably. Their coat may lose its glossy shine and their teeth may start to wither. As all older beings, Golden Retrieves too tend to get fussy about their eating habits as they attain their maximum age. But you must ensure that your pet is receiving all its proper nutrients via supplements, if it comes to that. Older dogs are more vulnerable to confusion. They sleep till late and stay up and night leading to loss of cognitive abilities in them. This may not come as news. Older dogs are more disturbed by loud and alarming noises than their younger counterparts. It is important to look after your Golden Retriever when it reaches its full potential since they are physically and emotionally most vulnerable at this stage. Golden Retrievers absolutely love swimming, and will never miss any chance of getting into water for a swim. Also, their glossy golden coats are not just beautiful and shiny, but also very much water repellant. They have been extensively used in therapy, since their presence is scientifically known to impart a good and happy vibe to those around. They’re amazing at tracking down and following other individuals due to the highly processed and advanced sense of smell of this species. There is a certain golden retriever dog information available dated back to early in Russia; Golden Retrievers were used as performing dogs in the circus. However, sources and reports don’t have enough evidence to back this claim. There are certain things to be kept in mind while dealing with a Golden Retriever. Although Golden Retrievers are good around children, a large Golden Retriever is capable of knocking over a small child in the process of playing with it. Hence extra care must be taken. No matter how old they get, Golden Retrievers need to exercise for 45mins to an hour on a daily basis in order to keep themselves fit and going, and keep their health in shape. Never compromise on the health of the puppy or encourage it by purchasing it cheaply from unworthy or untrusted sources. Give them mental training exercises on obedience and agility on a daily basis in order to keep their intelligent and sharp mind getting stronger and sharper. You will have to resist the urge to overfeed your Golden Retriever if you are going to keep them in shape. These dogs, as any other dog, love to eat, and will end up overweight if their diet intake is not monitored properly. Try not to leave them alone for long durations. It is best to keep them in the company of a human or other dog for their mental wellbeing. Ensure that your pup or dog is de-wormed, disinfected and is absolutely free from any contagious disease before you bring them into your household. You have now gone through detailed Information on Golden Retriever. You understood that a Golden Retriever is a good dog to own, but special care needs to be given to it via its training and diet in order to make sure that it reaches its optimum capacity. Hiring a keeper for your pet will be a wonderful idea, if your budget allows, and will definitely ensure the utmost physical and mental well being of your Golden Retriever.